I love fall, it inspires me to create quilted projects with which to decorate the house for the season. 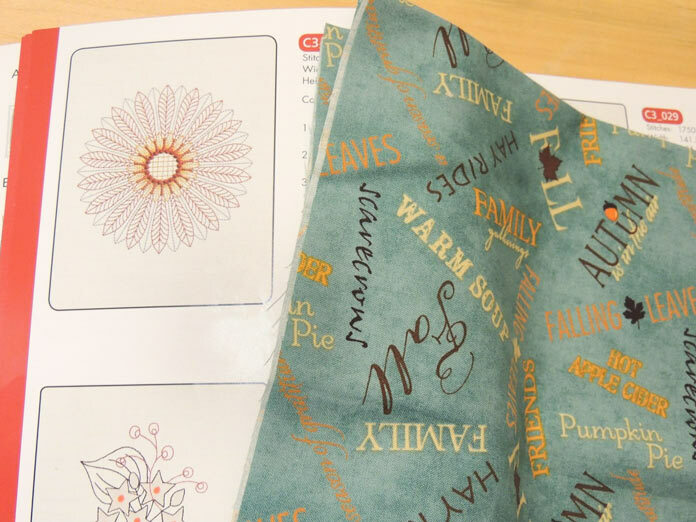 Follow me this week as I explore the built in embroidery designs on PFAFF’s creative 3.0 to make some new fall projects. The first thing I did was spend some time looking through the embroidery collection guide that comes with the creative 3.0. The guide has color photos of the designs with a list of the colors in each design as well as the stitched out size of the design. This was very helpful when looking for designs of different sizes that reminded me of fall. 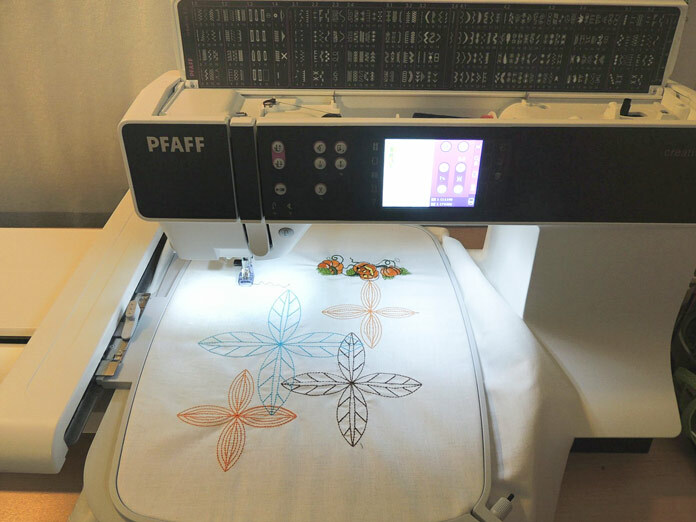 You can browse all 157 embroidery designs through the online version of the guide found on the PFAFF creative 3.0 page here. I also had just recently found a fun fall print with a blue background and words about fall in different color text – perfect! I used this as an inspiration print for the majority of my projects this week. Here’s a peek! 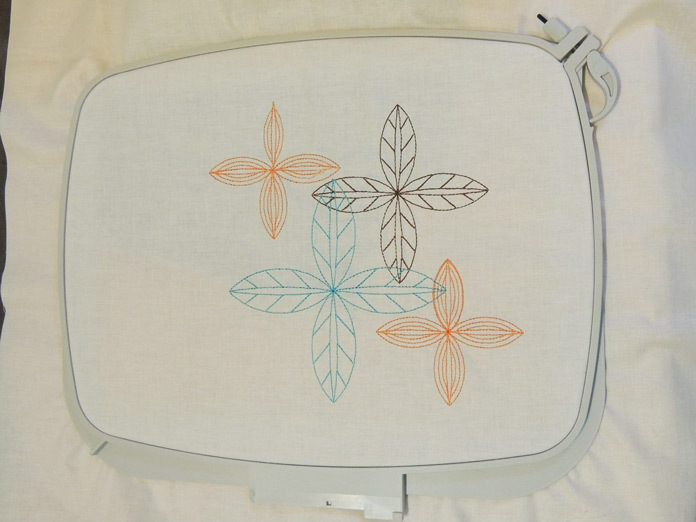 To select the designs on the creative 3.0 you need to have the embroidery unit attached. Then selecting the stitch on the screen will bring up a pop up that tells you which hoop to use. For trying out designs I had about a ½ yd of white quilting fabric set aside and I simply cut a piece big enough to fit inside the large hoop and to give me excess around the edge so I could make sure the fabric sat tight inside the hoop. 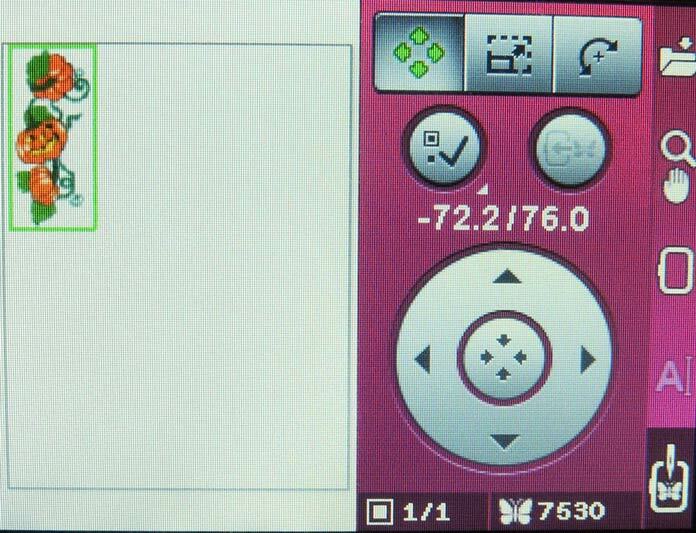 Once the hoop is attached the next screen prompt suggests the thread color to start stitching out the embroidery design. I used thread colors that coordinate with my inspiration fabric. Before I press the Start/Stop button to start the embroidery stitch out I lower the speed of the machine. Pressing for a long touch opens the speed control menu to let you adjust the level. Then I just kept going! I chose some smaller designs that coordinate with this one – it measures about 7½” square. I used the scale feature on the creative 3.0 to play with the size of the designs and placed them close to each other on the fabric to create my own design. The Color Touch Screen makes it easy to see and adjust designs in the hoop. I also found the stylus handy to precisely position my designs before stitching them out. I found a smaller built-in embroidery design that featured pumpkins! 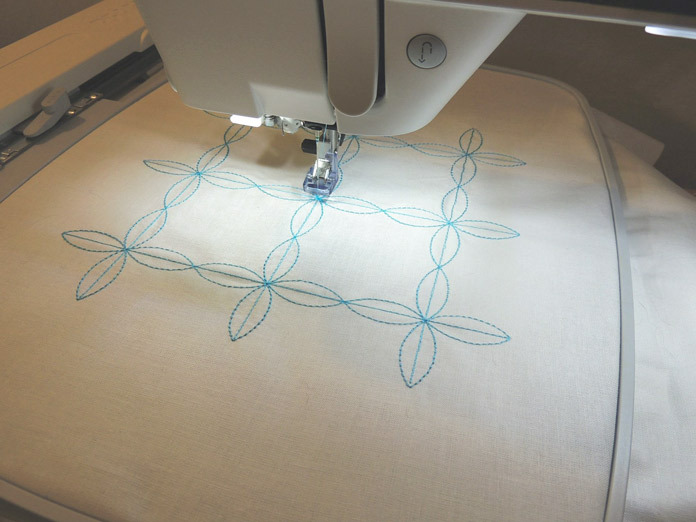 I knew I would be able to use this embroidery on lots of different projects – think mug rugs, bags, and table mats. I rotated the design once to stitch it out on the same piece of fabric as my previous embroidery, then I rotated it back to its original orientation and moved it into the top left of the hoop area. Now that I have several embroidery designs stitched out, it’s time to make some projects! I liked how easy it was to find several different built in embroidery designs on the creative 3.0 to use in fall projects. 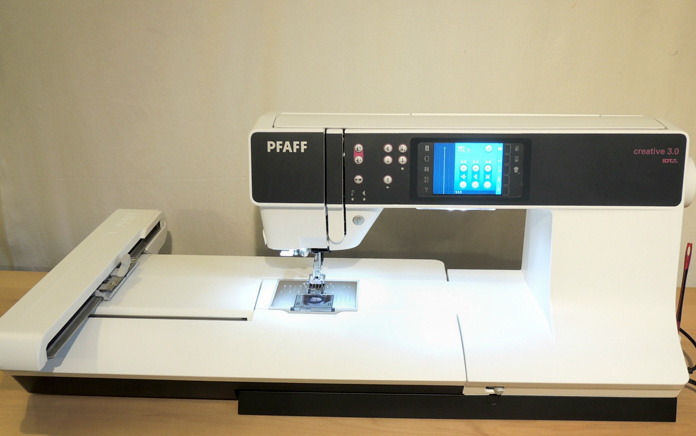 Come back tomorrow to see my first project I make using the PFAFF creative 3.0.